I usually make a batch of cookies on a Friday morning if I have my grand-kids over; we all deserve a little treat every-so-often and these delicious cookies really fit the bill. They can be made with either raisins, sultanas or dark chocolate chips (the darker the better). Interestingly, recent studies have shown that dark chocolate is loaded with nutrients that can positively affect your health. Made from the seed of the cocoa tree, it is one of the best sources of antioxidants on the planet. Studies also show that small amounts of dark chocolate (not the sugary stuff) can be beneficial to us. Melt the coconut oil then add to all other ingredients, mixing well. Chill for at least 15 minutes to allow the mix to stiffen. Roll teaspoonful amounts into small balls and flatten slightly on oiled baking sheets. BAKE: 350° for approximately 12 minutes. Do not overbake. These cookies are also delicious if sprinkled with a small amount of Pink Himalayan salt before cooking. 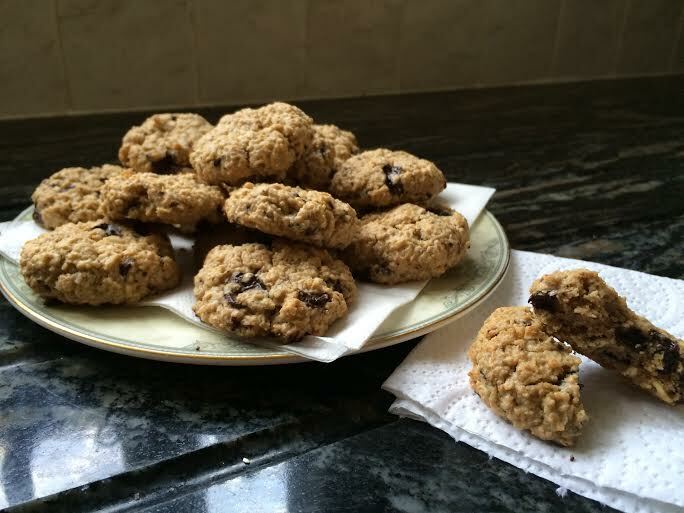 This entry was posted in Sweets and Treats and tagged Cookies, Gluten Free, Healthy Eating, Oats, Recipes, Wheat-Free. Bookmark the permalink.